Two life-sized exhibitions present a study in subjectivity for modern times. Social media can be a catalyst for culture change and even, as the Arab Spring showed us, revolution. But among many of the parents I know, these new digital tools tend to be discussed as something comparable to parasitic brain worms. Twitter, Facebook, Snapchat, Instagram – they command and channel young Americans’ attention in unprecedented ways. And because no one has ever been there before, there is no roadmap. While much of the complaining is about the stuff that has always led our worries about youth – narcissism, procrastination, misguided sexuality, vice culture and bullying – social media are tools whose possibilities have not even yet been imagined, and they are part of a massive culture change regarding our sense of community, credibility, personal experience and subjectivity. An exhibition at SPACE highlights how social media are reconfiguring our notions of reality and realism. Alina Gallo’s “We Are Staying” is an exhibition based largely on social media images from war-torn Syrian cities. It’s a large, single mural rendered in cartoonish style that wraps completely around SPACE’s annex gallery. 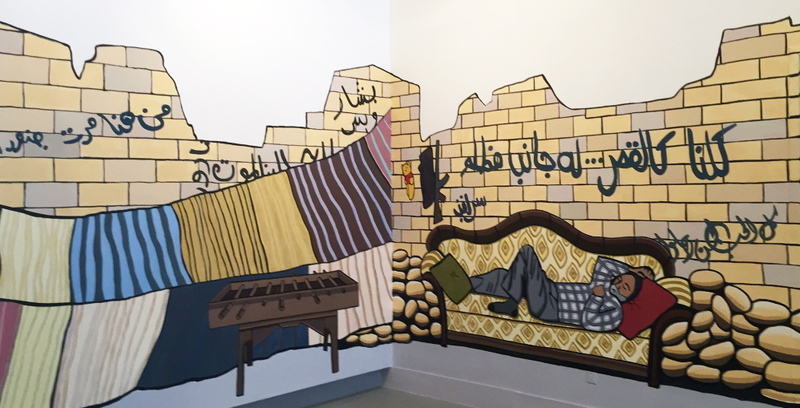 While the mural’s ostensible subject is an empathic view of the strife and human misery of the people caught up in the Syrian conflict, Gallo’s most powerful content is her insight into how social media and digital information are ushering in new standards of credibility and, consequently, a new form of realism. What Gallo seems to imply is that our new digital media (social media in particular) are structured like traditional notions of education and memory. Gallo sees a world of first-person accounts mashed into a new byte-sized stew. What is changing, she hints, is our subjectivity. “Staying” is joined by a similarly-scaled installation by Baltimore artist Gary Kachadourian. “Tree Lined Street” is a life-sized print of a pencil drawing of an American street. 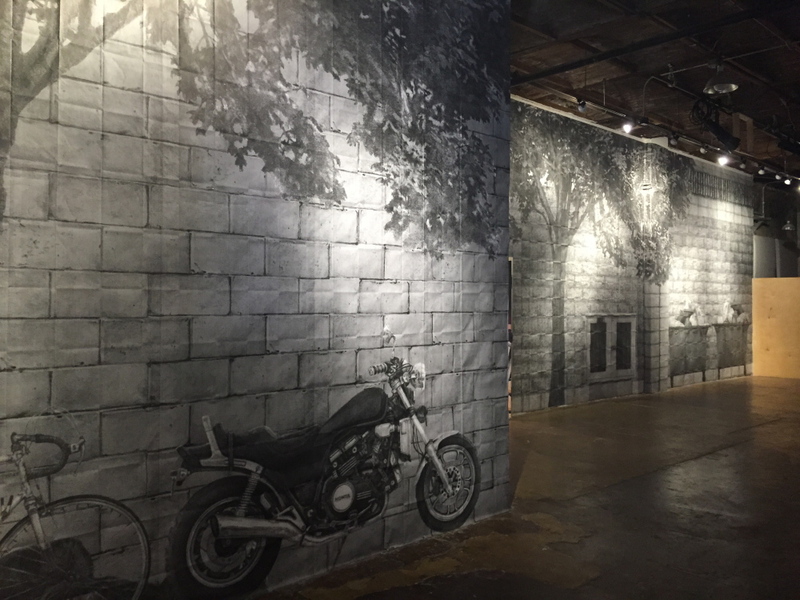 A motorcycle, a Volvo and a bicycle are parked on the street (although no one would leave an unlocked bike on a Baltimore street), depicted on previously-folded prints that have been stapled to the wall with the folds of the paper not only visible, but featured. The drawing feat is notable, but Kachadourian’s conceptualism is most impressive. “Street” is like Duchamp’s museum in a box (“Boîte-en-valise”) in the age of Amazon.com. The scale of the subject and the scale of the installation are both monumental, but somehow the pencil drawing remains as the defining crux of the installation’s authenticity (the same thing as a photograph would not be the same thing). 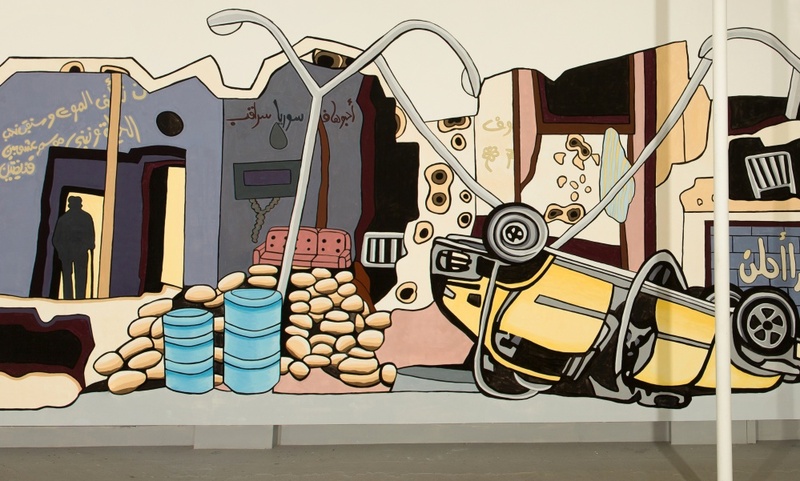 What is magnified is Kachadourian’s own subjectivity as an artist. 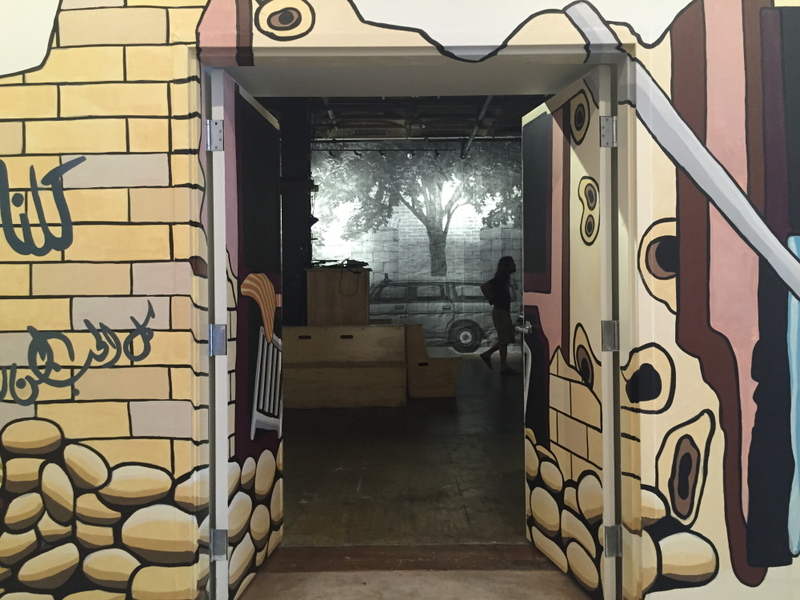 “Staying” might sound more impressive in its sociopolitical concerns and onsite execution than “Street,” but the apparent superiority dissolves the moment you step through the door from one installation into the other – an art experience unlike any I have ever had. Both installations occupy the entirety of their respective galleries. You need to experience both from the perspective of your own body (it’s a subjectivity thing). It’s potentially a very quick visit, but they are fascinating installations and they bring out the best in each other. “Street” is easier to appreciate, because it’s easier to see what Kachadourian is up to. Since we can all relate to drawing with a pencil, his realism and scale are immediately within our grasp. The objects – an old car, the brick walls – are the stuff of our daily existence. We know them like the backs of our hands, so we have no problem perceiving Kachadourian’s accomplishment. Even the move from photorealist drawing to printed installation feels meant to be noticed, so we can follow his conceptualist gestures. The only camouflaged content, however, is possibly the most impressive aspect of the show, and it isn’t clear if the tip of the hat belongs to Kachadourian or SPACE’s curatorial staff. (My money’s on the staff, but I am guessing.) SPACE’s stage, benches, bar and other accoutrements of activity allow “Street” to play the part of wallflower. The scene, after all, is more Portland than Baltimore. It’s where we live and, therefore, part of who we are. It is our background – our subjectivity. Oppositely, Gallo’s Syria is alien. The scene is even rendered in a graphic novel style offering legibility at the cost of credibility. While Kachadourian’s “Street” is a multiple (think print) that was unpacked from a box and stapled up, Gallo spent two full weeks painting “We Are Staying” on site for this one-time show (and, as I have pointed out in past reviews, Gallo can paint). It’s an exquisite contrast. Gallo’s installation gives the impression we are in a bombed-out building. Figures stand guard outside the building’s rubble walls all around us. But the experience is a subjective swirl of dream logic: There are street lights in the space and a bomb-flipped car. A horse is saddled, ready to take us to action. And, most intriguingly, a fellow freedom fighter (our proxy?) naps dreamily on a couch under a Pooh Bear toy hanging near a very fake (toy?) gun. But the gallery setting exerts such a powerful sense of interiority that the scene cannot completely crumble into objective reality. Rather, under logical scrutiny, it crumbles into a constellation of indirect observations. It is a surreal, swirling and subjective place. Just as Kachadourian’s “Street” becomes our background, Gallo’s crazy world becomes a model for memory. Instead of a Proustian pastry, however, we get a taste of our own mental understanding of foreign situations as they are constructed bit by bit of pictures and journalistic accounts. It is a roadmap of our cognitive reality – our new subjectivity. And Gallo even accompanies that map with a key: translations of the Arabic graffiti that covers the wall, explanations of some of the sources (social media, news, memory, etc.) and so on. Photorealism is a compelling but very limited cross-sectional version of reality, depicting one moment with no temporal context. Gallo offers a compelling new model of realism. This is social media realism: personal accounts, rumors, news links, translations, anecdotes and so on, all blended within the subjectivity of a single person over time. In our CGI and post-Photoshop world, we are shifting away from photorealism as our baseline for truth. But few artists have inquired as clearly as Gallo about what is taking its place. There is no simple answer of course, but social media is a huge component of whatever it is, and that is one of the few clear cultural legacies of the Arab Spring.